Speaking on region-specific terms, IE9 has strengthened its position in the US markets too with a gallop of 8% browser share in April 2011 to 35% in December 2011. Though IE8 has seen a huge downfall in its user share, both worldwide and in US, Google Chrome is climbing up steadily from 12% to 16% in the US. And as expected, the present market trends aren’t that kind to Mozilla Firefox which has seen a decline from 19% to 17% in the US. This may not be a huge difference number but if it continues with its Rapid Development Cycle, minting out a new version every six weeks, then the time is not far when its user base may be reduced to single digits. Maybe. These statistics are of course only about the browser share on Windows 7 operating system but according to Microsoft, it has sold more than 450 million Windows 7 licenses and that is equivalent to 8 times the entire Mac user base. Maybe that explains the significance of Windows 7 and the percentage of browser share on it. Microsoft is making moves to promote Windows 7 and IE9 while it gets ready with IE10 to be released along with Windows 8. The reason Internet Explorer has high browser share is that even if you hate it and never use it, many people don’t know how to remove it. A livello mondiale la situazione è molto diversa, perchè Chrome la fa da padrone. As always, MS is playing the “hype game” and distorting the facts about the numbers. When you look at the graphs, you will notice that IE8 usage has declined on a nearly identical curve as IE9 usage incline. This indicates that the increase is, in reality, nothing more than IE9 replacing it’s predecessor…no doubt as a result of being IE9 “force fed” to Windows users via Windows Update. One must also consider that Windows 7 users are still the minority, so the entire formula used to arrive at the above numbers is seriously flawed. But, as usual, with this writer, the facts are irrelevant when compared to the hype. The ONLY reason IE has always had the largest chunk of the market simply because it is integrated into Windows…not because it is a better browser than the others. If IE had to compete on an even playing field with Chrome and Firefox…it would lose miserably. I’ve got no authority to make up numbers as I wish and neither am I interested in doing so. The Windows 7 sales figures were revealed by Microsoft at BUILD 2010. Also, there wasn’t any hype being built. Instead the actual figures were presented, which again contradicts what you just said. IE 9 is love/hate for me. I like that Microsoft has significantly improved Internet Explorer. But I hate how it has ignored a core group of users from the start. XP still has a lot of users and even though I have moved on long ago to Win 7. Microsoft has alienated a lot of potential users of IE 9. For me I find it hard to understand how Microsoft could extend XP’s life by installing it in netbooks and then extending support. Yet, turn its back on browser upgrades. What else did they think would happen? If you still use XP your moving on to Chrome or possible Firefox. Then when those XP users finally move on to Windows 7 or Windows 8. What browser do you think they will use Microsoft? Probably not IE. I have to agree, that everything I have seen has not pointed to a huge influx of people going to Windows 7 other then new computer buyers. I just have not seen the adaption rate and most statistics point to this. IE 9 is a great barometer because it does not work on XP. So if IE 9 goes up then its clear its Windows 7 users most likely because Windows Vista is not sold or installed on any computers anymore. 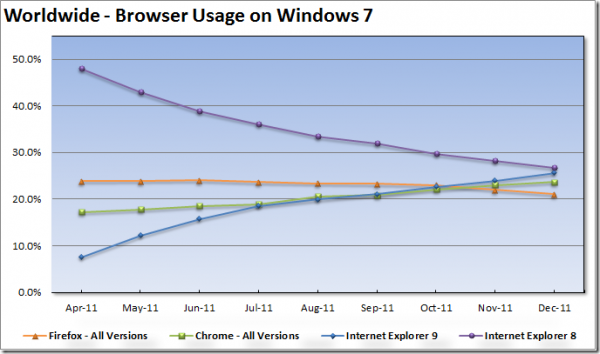 I definitely see a faster Windows 7 adoption then IE 9. This tells me that while people are buying PC’s with Windows 7. They are installing alternative browsers. Actually, it contradicts nothing. Look at the graphs for yourself. The IE9 increase is nearly identically proportional to the IE8 decline. Showing that the increase is simply due to the fact IE9 is replacing IE8 on Window 7 computers via Windows update…it’s plain as the nose on your face. Those graphs are not showing anything but the MS forced evolution of IE. The Windows 7 sales figures that were revealed by Microsoft at BUILD 2010 are irrelevant to this topic this topic…except for use as misleading hype. Its amazing how people defend this browsers,that this browser is better than that blah blah blah, when there is not really significant difference between this browsers. I have used quite a number of browsers from Blackhawk to Opera to the big three to Safari to Comodo Dragon.Really?And Chrome does not hype? Firefox does not hype?Opera does not hype? Correction: Microsoft hasn’t been pushing IE9 through Windows Update. Its bound to test it in Jan 2012 and Brazil and Australia seem to be the first two countries to experience this. So that renders your above claim to be false. Coming to the graphs, users have a choice to not use a browser if it doesn’t suit them. A majority of them aren’t dumb enough to forcefully use IE9. Windows 7 does allow users to install other browsers if they wish to. 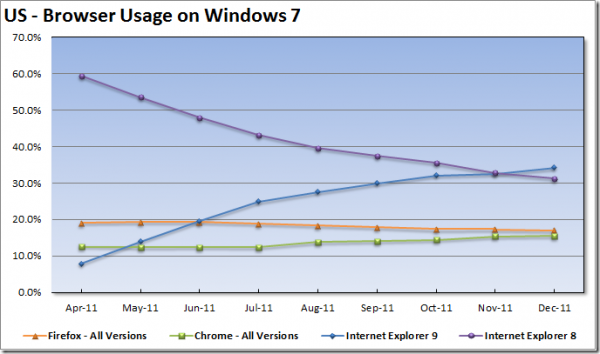 Yet, IE9 user base is ofcourse increasing! There, you just got it. This post wasn’t any hyped one and is actually as simple to understand as your anti-Microsoft stand is. I was being neutral though! could you tell me why skype dont support my windows ?? “Microsoft hasn’t been pushing IE9 through Windows Update.” Really? When was the last time you actually updated a Windows 7 machine that wasn’t already running IE9? MS has been pushing IE9 as an “Important/critical” update scene June 2011. IE9 downloads automatically and the user is not give any choices about it until the install process actually starts…at which point they will agree to anything just to get the update the hell over with. So, my above statements has most definitely NOT been rendered false. You comments, however, are completely inaccurate…bordering on an out-right lie. Ummm ohkay thanks for the pointer about the IE9 update schedule. I just mentioned behavioural facts about users above. I am not surprised that you take that as a lie. Its your take.